A comical story about a very busy bath. Pig is having a lovely bath. In come Sheep, Cow, Horse . . . . They are very noisy! Pig finds a way to make them go away. Oink! 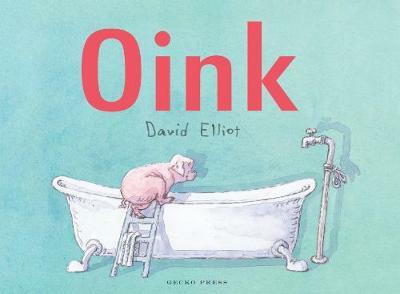 David Elliot is one of New Zealand's leading children's book illustrators. He has won many awards including the Margaret Mahy Book of the Year Award and the Russell Clark Award for Illustration at the 2017 New Zealand Book Awards for Children and Young Adults for Snark. Elliot has an international reputation, and has illustrated for Brian Jacques' Redwall and Castaways series, for U.S. authors T.A. Barron and Jeffrey Kluger, and John Flanagan's bestselling Ranger's Apprentice series. His picture book Henry's Map was chosen by School Library Journal for its Best Books 2013. Elliot was born in Ashburton and lives in Dunedin.